The cache of nine bronze coins may have been stashed fleeing Christians en route to Jerusalem as Persians invaded the land in 614 CE. The coins bear the images of three important Byzantine emperors. / Israel Antiquities Authority. 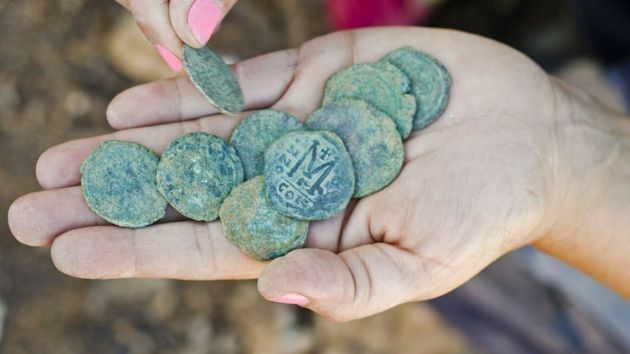 A stashed collection of nine ancient bronze coins from the late Byzantine era of 7th century CE, has been found by the Israel Antiquities Authority (IAA) in an excavation that began in June 2016. The excavation came ahead of the planed widening of Highway 1 between Tel Aviv and Jerusalem. The Netivei Israel Company, who are financing the highway, and the IAA are working together to conserve the historic site as a 'landmark in the scenery' alongside Highway 1. 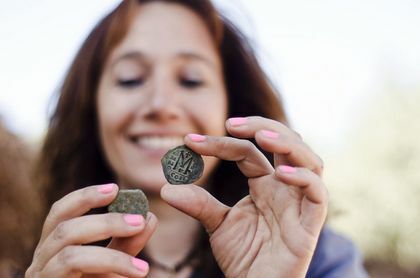 The coins were discovered alongside a collapsed two-storey building, which once served Christian pilgrims on their way to Jerusalem. They also discovered an ancient wine press. “He probably hoped to go back and collect it, but today we know that he was unable to do so", she added. The uncovered coins could be easily dated because they bear the images of three important Byzantine emperors, under which they were made: Justinian (483-565 AD), Maurice (539-602 CE) and Phocas (547-610 CE). They were struck at three different mints, Constantinople, Antioch, and Nicomedia, all of which are located in in present day Turkey. An image of the emperor wearing military garb and carrying crosses is depicted on the obverse of the coins, while the reverse indicates the coin’s denomination and is usually inscribed with the letter M.
Archaeologists believe the stash was made by Christians fleeing the Sassanid Persian invasion in 614 CE. “This invasion, was one of the factors that culminated in the end of Byzantine rule in the Land of Israel”, Landes-Nagar explained. Fearing an invasion and imminent danger, the residents of the site buried their money against the wall hoping to return home at the end of the disturbances, which did not happen. The site was abandoned and destroyed, and ultimately covered over and incorporated in the agricultural terraces that characterize the region. A Byzantine church was revealed in that part of the excavation.